With support from the province's Northern Ontario Heritage Fund Corporation (NOHFC), the Sudbury Finnish Rest Home Society, also known as Finlandia Village, is completing the construction of an 8,532-square-foot wellness centre. It includes a medical office for the home's in-house physician, educational programming space and a multi-purpose hall for larger gatherings. Investing in Northern Ontario communities is an important part of the McGuinty government's Growth Plan for Northern Ontario. A strong northern economy creates local jobs and protects the services that mean the most to families - health care and education. Ontario is supporting this project through the NOHFC’s Infrastructure and Community Development Program. Finlandia Village offers a mix of housing for 285 seniors including apartments, congregate living, assisted living and long-term care. It has recently completed the construction of 82 affordable apartments. This document was published on October 12, 2012 and is provided for archival and research purposes. 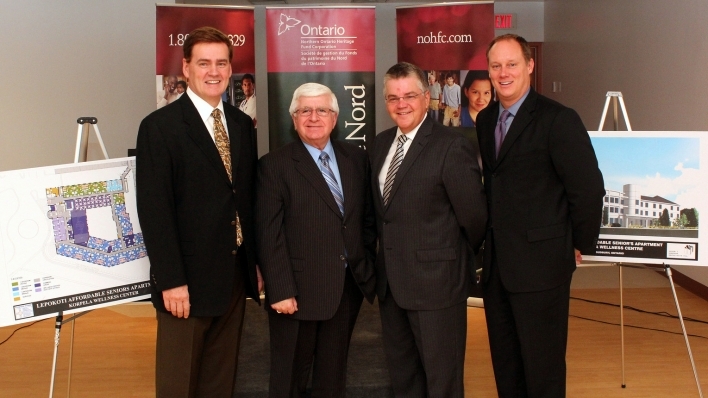 Northern Development and Mines Minister and Chair of the Northern Ontario Heritage Fund Corporation (NOHFC) Rick Bartolucci (second from left) announced a $495,000 investment to Finlandia Village in Sudbury to complete the construction of an 8,532-square-foot wellness centre. On hand for the announcement were (left to right) Dr. Gerry Bakker, Minister Bartolucci, Sudbury Finnish Rest Home Society Presdient Brian Koivu and Finlandia Village Executive Director David Munch.